Wales is a bit of a strange place to just up and go to for a long weekend (I think the last time I was that side of the Severn was for a conference in Swansea) but the WAY AGM was held there this year. 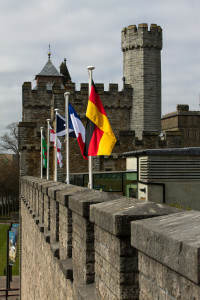 As it was a lot more attractive a proposition than the previous year’s Peterborough off I went to the capital Caerdydd. Having fairly recently gone first class on East Coast (though not since the franchise was renewed) and Virgin (to Liverpool) the experience with First Great Western fell somewhere in between. Free snacks and soft drinks but no proper meal or alcohol. At least Heather, fellow WAYer Pherenice, and I could relax in relative quiet while being whisked to a foreign land. 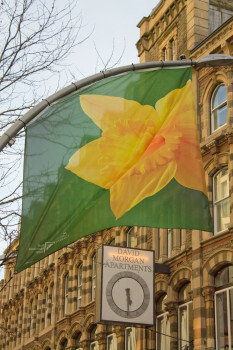 We arrived safely and, after a brief bit of map checking, made the short walk to the main high street, which was decorated with the flags of the countries competing in the Six Nations rugby competition (one had to look closely to find England mind). There was a bit of wandering up and down while Heather and I located our hotel (one word review: stairs), but once found it was easy enough to find the official hotel in which Pherenice was staying, enjoying a first view of the castle as we walked along the road to it. Depositing everyone’s bags there we found some lunch in the local O’Neills before Heather and I retrieved ours and finally checked into our hotel (up all those stairs). After that a good sleep seemed advisable ready for the morning’s activities. Saturday morning found us back at the Angel Hotel for the official business of the AGM. Important business was discussed, including an updating of the charity’s status complete with new constitution. The controversial interaction with members via Facebook and the new official website were also discussed. My personal opinion is that the leadership have missed the point of the ease of interaction of Facebook in the modern world. The website seems to have spent a long time reinventing a number of wheels and feels dated (but I’ve been using the internet for what counts as a long time—perhaps what feels to me to be outmoded concepts really are easier for those with less experience. Basically I just think there need to be a range of approaches rather than the dictatorial approach of the committee). There were also worrying figures for member retention presented, though I didn’t think these were discussed nearly enough. Official business concluded lunch was served but I decided to leave, the afternoon sessions holding no interest. 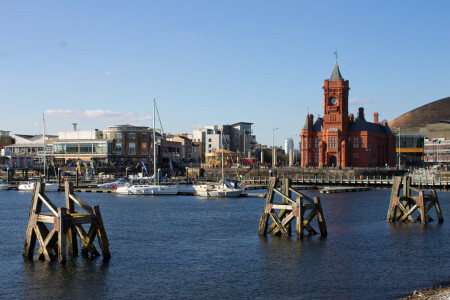 Instead of hanging round the hotel I wandered away to explore sunny Cardiff. Walking past the castle brought me to modern shopping areas, though the shopping centre had a strangely 1960s feeling back end. Cardiff seems to go in for little arcades running through buildings which were nice, with cafes and other little shops. There was a disappointing cathedral it took an age to find, though at least the former church opposite was pretty, built from material recycled from ships’ ballast. After a little while I’d made it back to beside the castle when Heather decided she’d also had enough of official activities and joined me. A bit of discussion revealed the bay area to be the most practical to explore for the afternoon so we set off to find a train to take us there. The train we found was possibly the smallest I’ve ever been on; a single carriage shuttle service running between Queen’s Street and the bay in a journey that didn’t even give me time to eat my sandwich. Arriving at Cardiff Bay Station is a reminder that what once must have been a truly vibrant and busy place has since seen degradation. There was a feel of decay as we made our badly signposted way towards the bay proper. Approaching the water there are signs of rejuvenation. A cookie cutter modern block of flats (complete with Elvis on a balcony) leads the way to what is quite a nice area of restaurants and cafes clustered around the bay beside the Millennium Centre and Senedd. 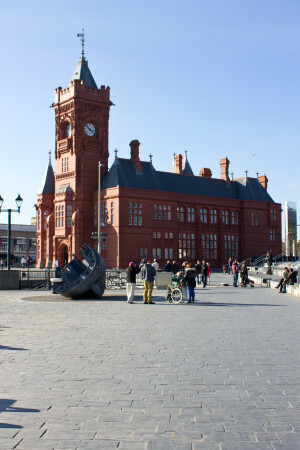 We stood for a while admiring the sunny bay before heading across the edge of the large Roald Dahl Plaza, drawn towards the Pierhead Building. 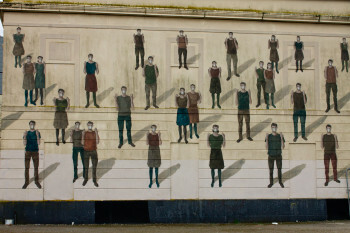 The building is testament to the bay’s original industrial routes, built as the headquarters of the Bute Dock Company. 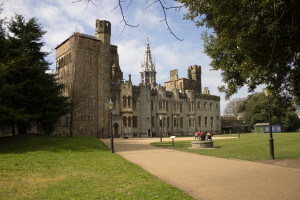 Bute refers to the Marquesses of Bute, who owned much of the coal rights around the area (and the railway leading into the docks)—it was money from this which would allow the Third Marquess of Bute to restore Cardiff Castle so richly. The building is church like, its slightly cavernous interior echoing to footsteps as we briefly looked around the interior. While the Pierhead Building is old the adjacent Millennium Centre is sparkling newness. We headed into it in search of a tourist information shop but that gave the chance to admire its the curves of its foyer and auditoria, reminiscent of the (architecturally superior IMHO) Sage in Gateshead. We headed back out and past the plaza again to head round the bay. 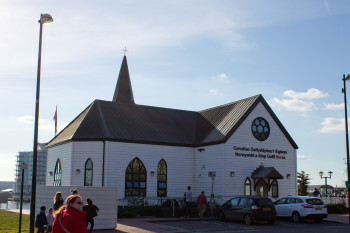 The Senedd building was another modern distraction, low slung and unobtrusive, before reaching the Norwegian Church. Unfortunately we couldn’t get too close a look as it was closed for what looked like a wedding. We did see the adjacent Scott Memorial at least. 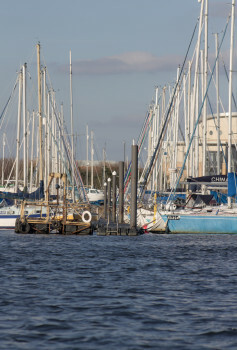 We made our way back along to where we started, intent on getting the train back to the city centre but then discovered the shuttle boat that would head from the bay up the river. We were just in time to catch the last trip of the day. The boat certainly made a more pleasant and interesting way to travel, even if it did sit a bit close to the water for my liking! 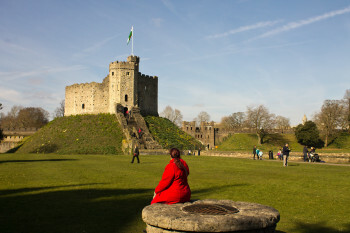 We peacefully headed through the bay and up past the Millennium Stadium before disembarking into the park by the castle. That meant it must be time to get ready for dinner. Dinner was back at the Angel, so Heather and I headed over there once we’d dressed for the occasion, Heather in a very pretty dress and myself even wearing a suit. The dinner itself wasn’t particularly impressive, and the choice of music at the after dinner disco left a lot to be desired, but at least the company was good as we partied the night away. The next morning saw me alone again. Heather is an area coordinator for WAY (a thankless and at times difficult task) which meant a morning meeting for her. 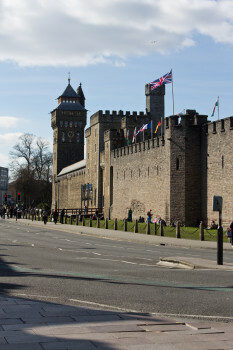 I took myself off wandering Cardiff some more, though not without the feeling that I had mainly seen it by now. It wasn’t too long though before Heather emerged and we could go and look at the one major attraction we hadn’t been within so far—the castle! 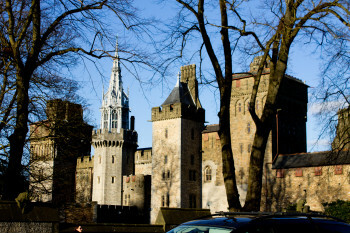 Cardiff Castle is a peculiar place to stand within. Initially there a sense of space within the enclosure, the curtain walls stretching into the distance, looping round in a tidy square from the gateway to the extravagent west range dominated by the fanciful clock tower. Then one realises one isn’t looking at a castle but a fort, the walls the Marquess of Bute’s reconstruction brought on by the discovery of Roman remains. The living quarters with the towering clock are also his restoration, an expression of the wealth we’d seen a more practicle aspect of down by the bay. Yet there, in the middle of it, a very Norman motte and shell keep, a reminder that yes, this is a castle in the true sense. There is actually little left on show of the medieval castle. 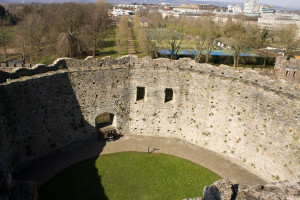 A line of low stones marks where a great cross wall and other buildings once stretched down from the motte to split the bailey and form the enclosed inner ward. The moated motte itself, with a well standing by the steps up and of course the keep. There may be some remains within the main gate but the rest has been subject to the ravishes of time and, possibly worse, the whims of owners and landscapers with little interest in preservation. Taking all this in for a moment we then went to pit stop in the visitors centre, neatly tucked behind glass wall and roof next to one of those rebuilt Roman walls (with the original Roman stonework on view). 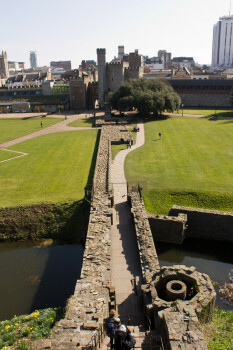 We followed the wall walk around the top, passing many flags of various nations and enjoying the elevated view of Cardiff, before retracing our steps within the walls, pacing the historically inaccurate gallery (which since being built to provide wet weather exercise for the Marquess had seen action as an air raid shelter). Saving the “proper” castle for last we headed across the sunny grass to the range stretching beneath the clock tower. You can’t freely wander the entire range but what is opened gives a sense of the opulence and money spent on it. The extravagance is no more in evidence that in an over the top bedroom ceiling, gold reflecting back in the afternoon sunlight. Downstairs there’s a hall and a lovely library with custom shelving, complete with little crenels to the top of the stacks. Back outside we finally made our way up to the keep, slowly ascending the stairs. The shell keep itself formed a lovely sun trap in which to take a rest (and admire the view) before climbing the remaining tower. The first part of that climb isn’t too bad but the last part up to the roof of the tower itself is a little harrowing; a dark, uneven and steep spiral stair leading up. We made it though and were rewarded with the spectacular view across Cardiff and the surrounding countryside, including to the distant Castle Coch which truly does look like something from a fairy tale. Descending back down from the top of the keep, and down the stairs, we rested a while in the sunshine before moving through the gift shop (to if nothing else buy another guide book, having left ours lying somewhere in the castle) before leaving the castle, and its strange mix of reconstructions, behind. There was still some of the dying afternoon to kill so we headed for another turn around Cardiff. 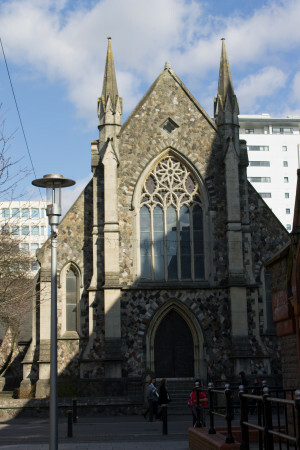 I led Heather to look at the cathedral and church I’d already seen, also taking in the indoor market. Dinner time approached and we drifted by the Millennium stadium before ending up, almost by default, in a Wetherspoons, uninspired. The time had come that Cardiff was nearly done. 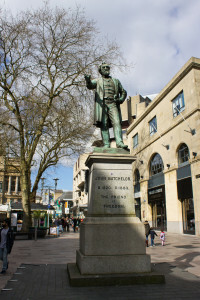 Next morning we left our bags in the hotel (having dragged them downstairs) and went for a last wander round Cardiff. Heather got to visit the cheese shop, where we also had brunch (chunky toast seems to be a thing). I got to visit the Lego store, where we bought minifigs we built ourselves. 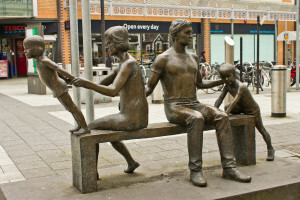 We went the long way round to get back to the hotel, down past the castle and shopping centre to come around past some more of Cardiff’s bronze sculptures and a quite disturbing piece of graffiti on an NHS building. Finally though it was time to leave the sun drenched Welsh capital behind, heading away, first class, back to old England’s capital and London town. There are of course a load of photos! I was at England once more. 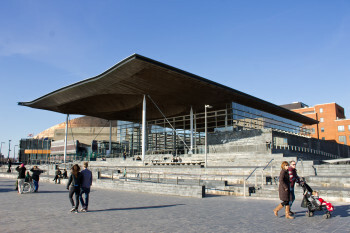 The post Caerdydd was first published on Sunday 19th April 2015 at 9:45 pm .